I have read elsewhere on this forum about hooking aux into the radio head, via adapters (for sale) that hook into the CD Changer connection. Where the heck is that connector? If you know, please answer w/o jargon and abbreviation. I think it might be under the the center console - around where my elbow would rest. Is that it? 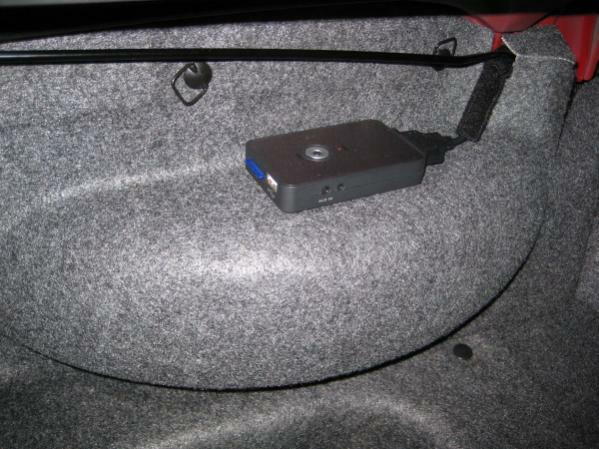 In the trunk, behind the panel that is next to the spare tire. Remove panel on passenger side to get to spare tire, remove panel on drivers side to get to CD changer connection. Thanks! I found it okay. I plan to buy an adapter kit that cost ~$80. I don't want anything fancy, just 1/8" audio input. Fishing that wire back to the cabin ought to be a hoot. They don't list the HON1 as working with AP1's, but I have one installed on my '01 and it works like a champ. The HON2 and HON3 are for AP2's depending on the year. You get full ipod control via the CD controls on the OEM head unit, you get an auxiliary input, and it's all plug and play. I'm very happy with mine. An aftermarket head unit is by far superior, but if you want to keep the OEM parts I highly recommend this product. Quick Reply: Aux / CD changer connector location?